Traffic is snarled, horns are beeping constantly, people cram the walkways and exhaust fumes from the buses hang in the air. The beaten down appearance of downtown San Jose and the scrolling barbwire along the top of each hotel balcony leave you with a feeling of uneasiness. Located in the oldest historical section of San Jose in the Barrio Amon (at 779 Calle 9) between Avenidas 7 and 9, sitting prestigiously lost in time, is The Hotel Don Carlos. The building, once a residence to two presidential families, now houses 33 rooms — each with its own distinctive character. At the hotel entrance, the staff cordially greet you. As you are assisted inside all of those feelings of unease start to dissipate, and you remember why you wanted to stay in downtown San Jose. The Don Carlos is conveniently located within walking distance of the zoo, the National library, parks, shopping, the Jade Museum and the Gold Museum. Not only is it an excellent base for most tours, but the hotel has its own small tour company that has a long-standing reputation for getting you the best outing for the best price. Warmth and charm graciously await you. The helpful staff provide unpretentious service; many are fluent in English and all are helpful if you are just beginning to speak Spanish. Inside the hotel you’ll find Annemarie’s Boutique which sells local artistic creations and Café Amon which serves a wide variety of meals at moderate prices. Upon arrival, you’re given a coupon for a welcome cocktail at the hotel. Each morning a full continental breakfast is served in the café and is included with your room. 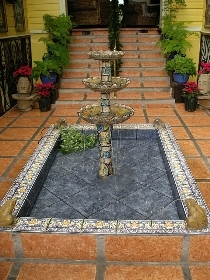 The hotel is decorated throughout with local art from both the past and present. It is a place that begs you to stroll through its gallery-like corridors and rest in one of the numerous sitting areas. The sound of free-flowing water draws you to a tile and porcelain fountain that marks the entry to an enclosed open-air central courtyard. The courtyard has a mini pool and Jacuzzi perfect for an afternoon dip. At night, the courtyard comes alive as the main gathering spot for drinks and socializing. Although relatively basic, the rooms are large with good lighting and relaxing areas. The bathrooms are squeaky clean. The best part of all is that there’s no shortage of hot water or water pressure. If you like to retire early, be sure to request a room away from the courtyard as the parquet flooring in the halls can echo quite loudly. This hotel is definitely not the Hampton or the Marriott but the staff treat you like a VIP. Staying here gives the Barrio Amon a welcoming feeling. You’ll leave with a sense of San Jose’s history and charm. Visit http:/www.doncarloshotel.com for more details, including an area map and pricing. Hotel amenities include a 24-hour security guard, secured parking, laundry service, and free internet.